Mayville Engineering Company, foremost manufacturer of reloading equipment in America, is widely respected for its continuing dedication to precision engineering. This precision is incorporated into every one of MEC's "New Generation" reloaders, rendering truly innovative and efficient engineering designs. The MEC 600 JR. MARK 5 is no exception. The Mark 5 offers the convenience of simple, single-stage operation at an affordable price. 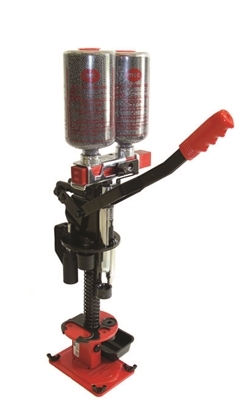 The Mark 5 is remarkable in that it performs each of the basic reloading steps with a mere pull on the handle- depriming, priming, resizing the metal base, measuring the correct amount of powder, firmly seating the wad column, measuring the precise amount of shot and forming a tightly sealed crimp. Every step of the reloading sequence is performed with a minimum of motion. An exclusive shell holder positions the shell at each station. No transfer die is required, and resizing dies at reconditioning and crimping station give your shell its proper form. The Cam-actuated reconditioning station with positive ejection. The Adjusta-Guide wad feed device with vertical adjustment to permit rapid wad insertion. The "Pro-Check" which keeps the charge bar in proper sequence to prevent spilled powder or shot. Best of all, the crimp die is now manufactured from a revolutionary new material called "DuPont Zytel" which makes maintenance a breeze. The glass-reinforced strength of Dupont Zytel far exceeds any requirements, is absolutely rust free, and actively resists the build-up of residue carried into the die on fired shells. Thus, the die slides effortlessly over the casing, making a perfect crimp every time. NOTE: This reloader will reload steel shot shells. To convert to steel shot kit #8433 is necessary. Do not use components designed for use with lead shot when loading steel shot shells. NOTE: A special steel shot charge bar must be used when loading steel shot. Do not use charge bars designed for lead shot when loading steel shot shells. MEC 600 JR. MARK 5 .410GA. MEC 600 JR. MARK 5 .410GA. 3"
MEC 600 JR. MARK 5 12GA. MEC 600 JR. MARK 5 20GA. MEC 600 JR. MARK 5 28GA. MEC 600 JR. MARK 5 10 GA.